Posted by gordonwatts in ATLAS, Hidden Valley. Anecdotes are wonderful things, used (and misused) all the time. They tell great little stories, can be the seed of a new idea, or bring down an argument. Have something that is always true? Then you need but one anecdote to bring it tumbling to the ground. People fighting the evolution vs. creationism battle know this technique well! Of course, it is often misused too – an anecdote does not a theory make or break! In experimental particle physics we have our own version of an anecdote: the event display. In the anecdotal sense we use it mostly in the sense that it is the seed of a new idea. Our eyes and brain are better at recognizing a new pattern than any computer algorithm currently known. I’ve often said that gut instinct does play a role in physics – and the event display is one place where we learn our gut instinct! You are looking at the inner detector of ATLAS – first (from inner to outer) are the highly accurate pixel detectors, then the silicon strip detectors, and finally all the dots are the transition radiation detector (TRT). The hits from a simulated Hidden Valley event are shown. Now, so the average particle physicist most of that display looks very normal, and wouldn’t even raise an eyebrow. Except for two features. Opposite each other, just above and below the horizontal, there are two plumes of particles. While plumes of particles (“jets”) are not uncommon, the fact that they draw to a point a long way – meters – from the center of the detector is. Very uncommon in fact. Your eye can pick those out right away. Perhaps, if you aren’t a particle physicist, you didn’t realize those were unique, but I bet your eye got them right away, regardless. Now, the problem is to develop a computer algorithm to pick those guys out. It may look trivial – after all something that your eye gets that easily can’t be that hard – but it turns out not to be the case. Especially using full blown tracking to find those guys… tracking that is tuned to find a track that originates from the center of the detector. Just starting at it like this I’m having a few ideas of things we could do to find those tracks. Say you already have an algorithm, but it fails some 30% of the time. Then you might take 100 interactions that fail, make event displays of all of them, create a slide show, and then just watch them one after the other. If you are lucky you’ll start to see a pattern. None of this proves anything, unfortunately. Anecdotes aren’t science. But they do lead to ideas that can be tested! Once you have an idea for the algorithm you can write some code – which is not affected by human bias! – and run it on your sample of interactions. Now you can test it, and you measure its performance and see if your idea is going to work. By measuring you’ve turned your anecdote into science. That is what I mean by the event display can be the germ of an idea. I’ve seen this technique used a number of times in my field. Though not enough! Our event displays are very hard to use and so many of us (myself included) tend to use them as a last resort. This is unfortunate, because when looking for some new sort of pattern recognition algorithm – as in this case – they are incredibly valuable. Another trend I’ve noticed – the old generation seems to resort to these much quicker than the younger ones. <cough>bubble chambers<cough>. Posted by gordonwatts in Conference, Hidden Valley, physics. 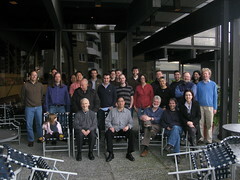 I spent a very enjoyable week attending a workshop here at UW – Workshop on Signatures of Long-Lived Exotic Particles at the LHC. These workshops are funded by the DOE – and allow us to fly in a small list of experts to discuss a particular topic for a week. As you might imagine, things can get pretty intense (in a good way!). The point about long lived particles is they are long lived! And not much else in the standard model is long lived the way these guys can be. 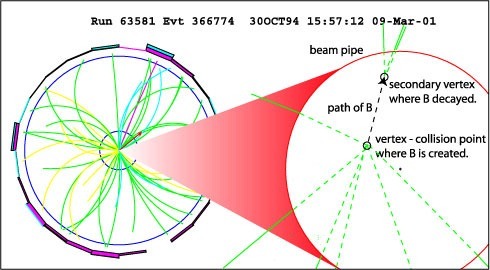 Sure, a bottom quark might travel a few millimeters – and most of us tend to call that long-lived. But the things considered at this workshop can go much furthers – meters even. All sorts of models can generate these particles – like SUSY or Hidden Valley. Nothing in a particle physics experiment is really designed for these things – not the hardware and not the software, certainly. Not clear our brains are thinking about them too well either! This is part of what makes them so fascinating! 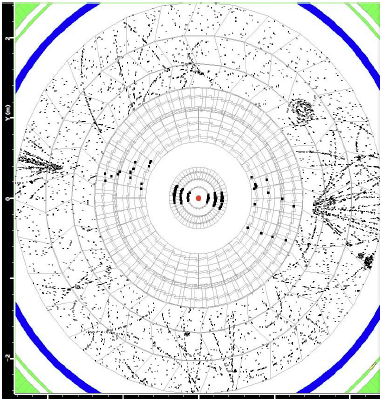 That is an exploded schematic view of what happens in our detector (this is a CDF event, I’ve stolen, from Fermilab). The inner circle on the left is about 2 inches in diameter. You see the exploded view on the right? The distance between the vertex and the secondary vertex is about a millimeter or so. That is normal long lived particle for particle physics. All of our code and the design of our detectors are built to discover exactly those kinds of long lived particles. That picture is from the small conference dinner we set up at Anthony’s, a local nice fish place here in Seattle. I’ve got more pictures from the dinner posted on my flickr account.